The vibrant Galeto, a restaurant specialising in chicken dishes and Brazilian street food, is the latest addition to the wealth of dining establishments in London's eclectic Soho neighbourhood. The interior is a mix match of reclaimed furniture in colour-popping greens, yellows and reds, mirroring the spirit of the carnival in Rio de Janeiro. 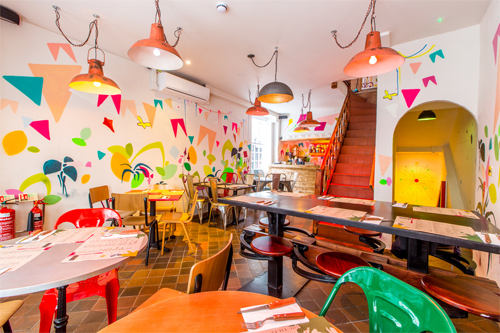 The equally vibrant mural throughout adds to the chaotic atmosphere and rustic South American charm of the eatery. It's a very informal experience for a restaurant, but the welcoming and attentive staff more than make up for that. 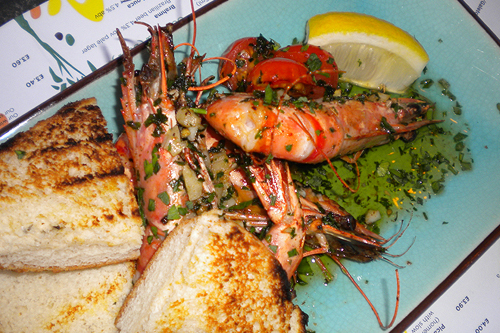 To start off the meal we tried camarao (pan fried tiger prawns with brioche) and frango a passarinho (marinated spicy whole chicken wings with crème fraîche), both of which were a success in taste and size. 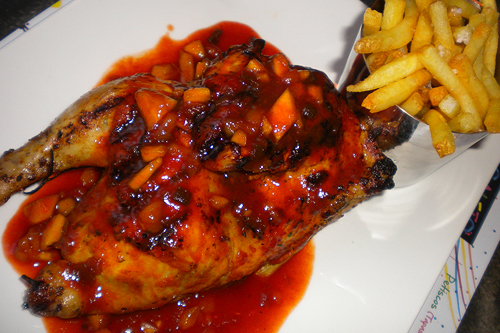 The chicken portion in particular was very large and with four big wings smothered in the piquant sauce it can easily be shared by two people. Just be warned that they are not kidding when they say the sauce is spicy. This is not a bad thing but I was very happy to have a glass of the extremely sweet acai, a berry juice from the Brazilian rainforest, to sip on after finishing off the plate of wings. As the galeto in the restaurant's namesake and speciality that was of course one of the dishes we tried for our mains, as well as picanha (steak with farofa and salsa). While galeto means little chicken, don't be fooled into thinking that the portion will be on the small side. On contrary, the meal comprised of half a young chicken which generously filled the plate and ended up being too much for one person to finish. Despite having been marinated for 24 hours the chicken didn't have the distinct flavour of its seasoning and the barbecue sauce lacked the expected kick and smokiness. However, the meat was plenty and juicy and fell right off the bone. The steak was cooked medium rare, as ordered, and went well with the small offer of salsa on the plate as well as the farofa, which is a toasted manioc flour mixture I hadn't had a pleasure to try before. Both main dishes came with a side of fries which sounded interesting, as they still had the skin on, but unfortunately were too greasy to be enjoyed properly. The restaurant does offer additional sides, including black beans and cassava chips, but as we were already getting quite full at this stage we decided against ordering them. We were however easily persuaded by the desserts menu and the excellent recommendations from our waitress. She suggested we try pavê de limão and mousse de maracuja, and we happily obliged. The pavê comprised of a smooth mousse layered with crumbling cookies and tasted like a rich miniature cheese cake with a zesty finish. This option would make for a wonderfully sweet albeit very filling finish to the meal. 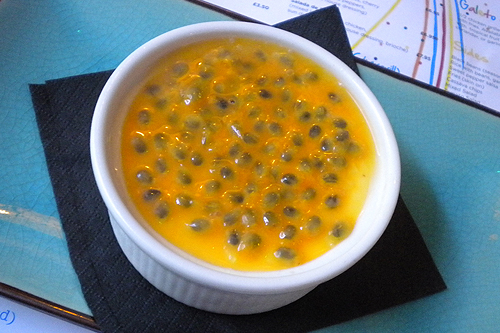 The mousse de maracuja was the lighter choice as it was exceptionally creamy and had a lovely thick layer of tangy passionfruit on top, which was very refreshing after the otherwise heavy meal. We recommend visiting Galeto for one of the delicious desserts alone, which for this reviewer were the irrefutable highlights of an already pleasant evening. And if you're in the neighbourhood, after having seen a play or musical at one of the nearby theatres, the long opening hours provide the perfect opportunity to wind down before heading home.